in need of new designs! Hi everyone. I’m in need of different designs to do besides the granny square or the patchwork granny square. Anyone know of any good designs that aren’t overly intricate?? Thanks!! Trying to make 4 to 6 afghans to sell for a charity and want to make them different looking color and design wise. this was really easy to do! Its a fast TV watching pattern :) I used three colors and carried them up the side of the work. 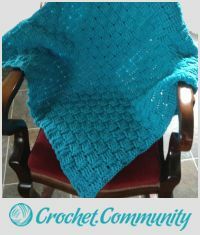 Here is the link to the C2C afghan. Easy once you see how the stitch is worked. There is a tutorial in the link. Very easy to customize. Thank you! I really appreciate the designs! 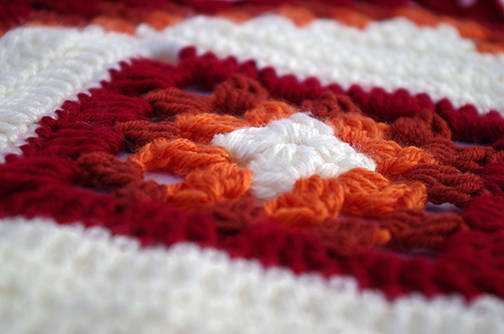 This pattern starts with a basic granny square, but it gets spun 45 degrees and becomes a diagram within frames. There have been versions of this with lots of cut ends which means more woven in ends, but I´ve re-designed it to be done all with one un-cut strand of yarn. that is pretty. .. will have to look at that pattern.